Teaching English Learners who are new to the country and are non-English speakers is a challenge at every grade, but it can be particularly challenging at the high school level when students have to earn credits, pass multiple state end-of-course exams, and engage with complex texts on a daily basis. With so much at stake and a huge language gap, it can be very difficult for both English Learners and teachers of these English Learners to feel successful. 1. Use a graphic novel instead of the original text. I chose to use a graphic novel because pictures are understandable in any language. Beginning English Learners need picture support no matter what level or type of text they are reading, so I always choose texts with pictures or adapt texts by adding pictures. I used the graphic novel by Classical Comics called Romeo and Juliet: Quick Text for this unit. Even though this is easiest reading level Classical Comics offers for Romeo and Juliet, it was still challenging for my students, and I had to pre-teach some antiquated English terms, such as “farewell” and “thou.” However, using a graphic novel proved successful. When beginning a new scene, as a class we would usually look at the pictures first and discuss what we thought was happening. Once we started reading, students would discover vocabulary in the text that supported their predictions. Sometimes I showed pictures from the novel with the words whited out and asked students to summarize what was happening in the pictures, giving them the chance to use that vocabulary again in speaking or writing. 2. 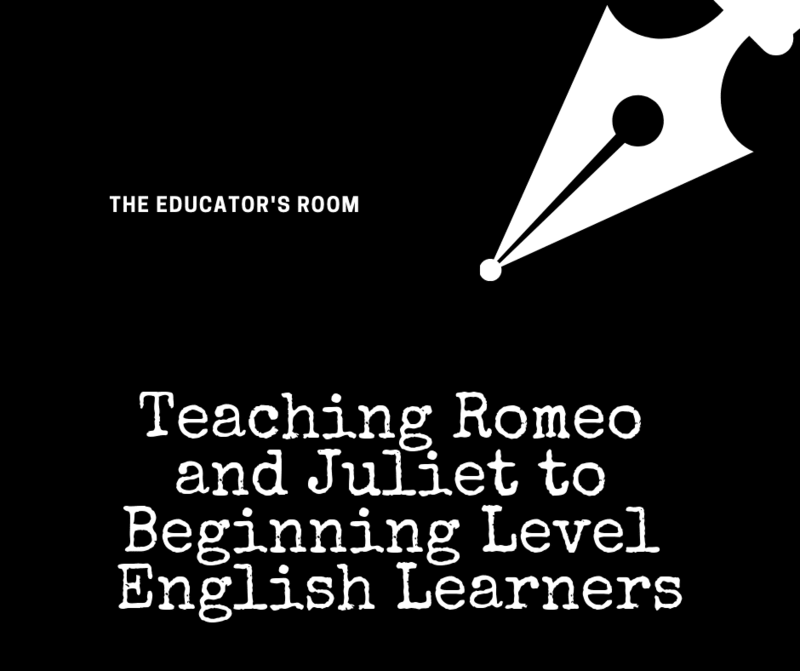 Hook the students by connecting themes in Romeo and Juliet to their own lives. Before we even started reading, I planned a week of lessons centered around themes in Romeo and Juliet that are of interest to teenagers: love, marriage, gang violence, and suicide. We spent time talking about norms around dating and marriage in their countries and I gave students the chance to agree or disagree with statements and pictures about love. Students seemed to appreciate the chance to voice the difference between what their cultures or parents taught them and how they personally felt. We then moved onto a lesson about gangs. Sadly, many of my students have experience gang violence in Central America. They were actually eager to talk about the effects of gangs and gang violence and what could be done about it. Once we started reading the play, I connected that idea to the rivalry between the Capulets and the Montagues. Lastly, we talked about suicide, and I started the lesson by showing the music video of the song 1-800-273-8255, which is the suicide prevention hotline number. Though the words were in English, most of my students caught the gist of the song, and with the help of some translation, as a class, we were able to discuss the signs of suicide, the causes of suicide, and how to help a friend who seems suicidal. We circled back around to the concept at the end of the unit, and students were able to express whether they agreed or disagreed with the actions of Romeo and Juliet and why. 3. Engage in collaborative comprehension activities. Collaborative and cooperative activities are how I engage students, and student-student interaction is a key part of language development. Every day, I made sure to have some kind of interactive activity to review the scene we’d read or practice vocabulary. One of my students’ favorite activities was Parallel Lines, where we would split the class into two groups and the groups would form two lines facing each other. Usually, I would post a few comprehension questions with sentence frames for answers on the screen, and partners would take turns being the questioner and responder as I wove through the lines listening to answers. Another activity we did was paper Instagram posts. Using a blank Instagram template, students had to create a fake Instagram post with an illustration or either Romeo or Juliet and two sentences that showed what the character was thinking or feeling. Then we put the posts on the wall and did a Gallery Walk in which students wrote comments on the Instagram feeds from the perspective of another character in the play. 4. Build language through oral and written opinion opportunities. Another part of engagement was weaving in a chance for students to express their opinions in English. Opinion is a precursor to argumentation and critique, and it’s where I start with beginner English Learners. My students responded to journal questions such as Marriage makes people happy or When have you disagreed with your parents? These questions were translated into students’ languages, and they had the choice to respond in their native language, but then I asked them to attempt to write key words from their answer in English. Students were often surprised to find that they knew more English words than they’d expected! By the end of the unit, many of them were responding to these questions in English with the help of sentence frames, such as I agree/disagree because ________________ or I think _____________ because ___________. Using these four strategies, my students were able to comprehend and articulate the big ideas in Romeo and Juliet, exchange opinions about the text, and develop new robust vocabulary. Karissa an ESL Educator with 18 years of teaching experience, including 16 years of ESL experience. She has a Masters of Education in Curriculum and Instruction with an emphasis in TESOL. Having experience teaching ESL at both the elementary and secondary levels, and she was also an Instructional ESL Coach for five years in the Nashville, Tennessee but currently, teaches ESL in Baton Rouge, Louisiana.